THE SKINNY: I was just tired of my old mouthwash when I saw this one on the shelf at Kroger and bought it on impulse. 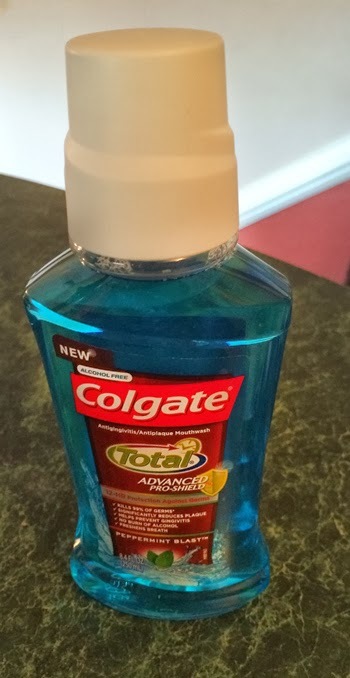 I have been really happy with Colgate Total Advanced Pro-Shield Mouthwash. The wash has an easy to swish, alcohol-free formula that makes your teeth feel fresh and clean. I like that it lasts for a while without the feeling of residue, like some other mouthwashes. I know dental hygiene products are not a staple of Beauty Test Dummies but great-looking teeth are essential to your beauty routine, right? CHECK IT OUT: Colgate Total Advanced Pro-Shield Mouthwash comes in three flavors and is available at grocery stores, drugstores and online.